A workshop proposed by Shenkar College of Engineering and Design in Israel, result of a unique collaboration between the Department of Interior – Building and Environment Design and the Knitting Workshop and Plastics Engineering in Shenkar together with Dipl. Ing. (TU) Norbert Palz, an architect from the Royal Danish Academy of Fine Arts, School of Architecture, CITA, Center for Information Technology and Architecture. The workshop was initiated by Prof. Shraga Kirshner and is based on a three-year long collaboration between Dr. Eyal Sheffer and architect Ayelet Karmon, who have been exploring the potential of three-dimensional knitted surfaces to become elements of the built environment. The workshop is open to students and professionals from textile design, interior design and architecture. The workshop will offer the use of a parametric design tool, ParaCloud Ltd., which converts spreadsheet driven matrices into a powerful generative and associative modelling application. This tool allows the positioning of adaptable cell components on given surfaces and their optimization with relation to the overall surface tectonics and behavior. Behavioural attributes of various knitted surfaces will be explored through the production of computational models and material prototypes in the Knitting Workshop and Plastics Workshop at Shenkar. 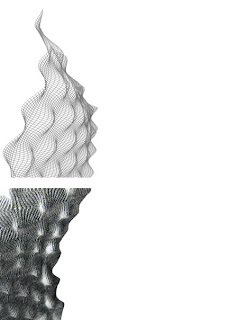 Since textile surfaces naturally attain complex geometrical behaviour, both at the level of the overall surface and the local stitch, CAD tools become exploration tools for the behaviors of these surfaces. The workshop will incorporate the use of different materials such as advanced composite materials, to achieve both rigid and elastic conditions.